I don't give Ray Bradbury's "Something Wicked This Way Comes" praise lightly. This was a book I first read many years ago in junior high, back when I used to take some of my lunch breaks and spend reading in the library. The librarian never bothered me, and I read as many books as I could fit into a lunch period (which was maybe one or two books depending on the length of each book). It took me two lunch periods to read this book because I wanted to savor every last word. Why? Because Bradbury's prose pulls you in. The way he uses language and imagery to toggle this coming of age tale with horror elements is brilliant. There are times you can feel the weight of the prose for its respective movement - and I think that was one of the reasons why I originally gave this book 4 stars from what I remembered of it on nostalgic value alone. But upon my reading it this year (2014), I realized that when it worked - it worked extraordinary well. The emotional impact and beauty of it translated even moreso through the audio reading that I heard of it. 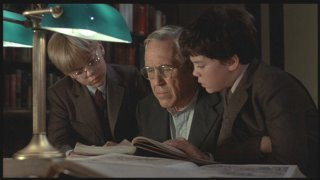 What I did remember, in both the book and film versions, was the strong assertion of the central characters of this tale: Jim Nightshade, Will Halloway, and Will's father, Charles Halloway. Will and Jim have a friendship that's joined at the hip, so to speak - a bond that shows in their ages (boys of thirteen years, but they're within a day's birth - one born October 30th one minute before midnight, and the other after - which was on Halloween). The fact that they live next door to each other, even from the time we meet them as a lightning rod salesman tells them of a "storm coming," you can tell the two are inseparable. But while the boys think that an actual storm is coming through the area, hence taking the lightning rod and sticking it atop Jim's house for the warning, the "storm" that's really coming is in the form of a traveling group of entertainers/carnival performers. And at the heart of them is one seemingly powerful presence in "The Illustrated Man" a.k.a. Mr. 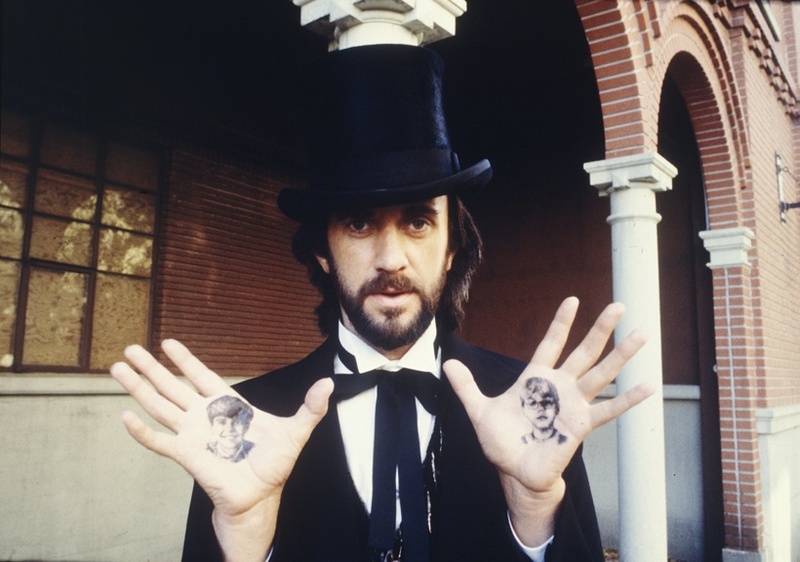 Dark (in the film portrayed by the alluring Jonathan Pryce). Mr. Dark/The Illustrated Man is quite the character. He provides the surface promise of giving youth/time back to the people he comes across - and for those who are old enough to feel the burden of aging/time passage, they take him up on his offer. But then that begets a few questions. What's the cost to the person who wants to age up or down? What does Mr. Dark get in return? Jim and Will are apt enough to discover the answer in a series of horrifying observances and discoveries of identity for individuals who are tempted by the offer. It's a clever way to depict a coming of age tale (literally), but also quite horrifying in terms of how time can get away from people when they're not recognizing it or seizing the chances it provides. Also for a warning to people to be careful what they desire, because it can have consequences that one may not expect at all. But coupled with the boys trying to elude Mr. Dark's lures to the carnival, is the story of Charles Halloway grappling with his own age and sense of time, while also trying to establish better relations with his son. He's a librarian, traveled through library after library during his youth, but the woman he married grounded him and he's been "living in the same town ever since." I actually appreciated Mr. Halloway's struggles in the novel much more now than I did back when I was younger (because I actually identified more with the boys back then, go figure). But it all came together so remarkably well for theme and juxtapositions. 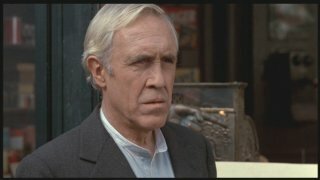 Even in the film, Charles's character (played by the late Jason Robards - and this was the first film I ever saw him in) is a man who struggles between his youth and where the time has gone to his 50s. But even he doesn't take Mr. Dark's offer so lightly. The novel may take place in the 1930s, but it still feels like the tale transcends time with the heart of its conflict and thematic. One of the scenes from the book that stood out to me over many years time was the scene where the boys are hiding in the storm drain from Mr. Dark. Will's father's looking for the boys and finds them hiding - but then has to play it off in front of Mr. Dark to keep the boys safe from the carnival master's clutches. I remembered the images of the boys in each of Dark's palms, then him squeezing so hard that blood dripped from his hands, down to where the boys were hiding. That creeped me out now just as much as it did back then - and it was a powerfully portrayed scene for image in the book, among many others. I loved this book - for image, for thematic, for language, for the setting - the whole measure. I would definitely recommend it - as I think you could do no harm with Bradbury's works in general. It's among my favorite narratives for sure. I'll admit I have a fondness for the movie and would recommend it as well. But...uh...I would not show the movie to anyone under middle school age. Fair warning. 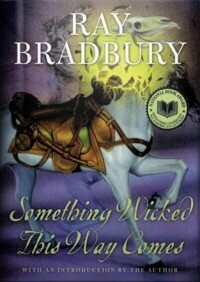 I'm really glad I re-read this book overall - and Ray Bradbury will certainly be missed by yours truly, among many.